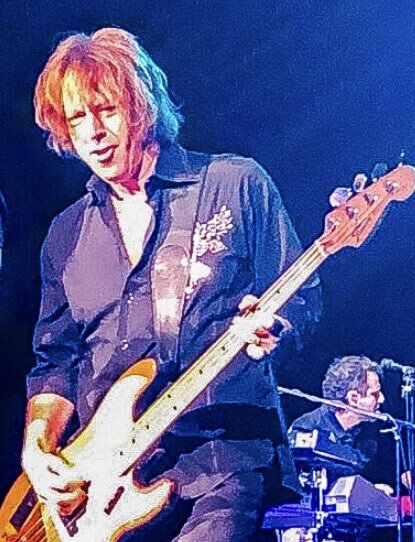 Foreigner's bass guitarist, Jeff Pilson, is undoubtedly one of the busiest guys in the business. Aside from traveling 200+ days a year with that classic rock powerhouse machine, he also juggles a few side projects at a time. If you think that the supergroups were a thing of the past then you need to pay closer attention because Jeff has a knack for not only combining established rockers but also bringing them to a higher musical level. Just last week THE END machine, his project with ex-Dokken bandmates George Lynch and Mick Brown, plus Warrant's Robert Mason on vocals, dropped their first song, "Alive Today" and with it came great reviews. While he is anxious for THE END Machine's full release on March 22, followed by a few tour dates, Jeff is also bursting with excitement over other things to come. "I do have another project that I'm working on and it's almost two-thirds done already. There are some great players involved and two of them are Reb Beach (Whitesnake, Winger) and Robin McAuley (McAuley Schenker Group, Survivor). We're working on a record that is coming out unbelievably fantastic. I'm crazy about it and just so happy with the way that it's turning out. It's everything that you would hope for with this lineup and so much more. You can probably look for that either at the tail end of this year or maybe early 2020. We'll probably be done with the record soon because we're on such a roll. The writing is crazy great. Reb is actually coming here tomorrow and he'll be here for a week to finish up. It's all just really spectacular and I'm so unbelievably excited." While Jeff is the catalyst in so many collaborative efforts, it's not lost on him that he gets to work with the very best of the best players in the rock game. "I'm really lucky that I get to work with this level of talent because it makes it more fun and to me, there's a different vibe about music when there is fun attached, That for me, is the spark that lights the whole flame. We've been working hard and being really productive, but we're also having fun and everybody is just shining. Reb is another of those guys that don't always get the spotlight on him and so I think people may not always understand just how talented he is. You also haven't heard any new material with Robin singing for a while and his voice has actually gotten better and his writing is just amazing. The three-way writing chemistry between Reb, Robin and I has been really strong so, wait till you hear it!" Check out the clip below to hear the entire interview with Jeff Pilson.